•Liquid-cooled 2-stroke crankcase reed valve 75°V-twin engine •Power jet carburetors with throttle sensor for precise digital control of combustion efficiency and linear throttle response •Free-flowing ram air system delivers the power for high-speed competition •RC valve ensures both strong low-end torque and dynamic high-end power output •Large, high-efficient curved aluminum radiator •Chassis architecture of Aluminum twin-tube frame and swing arm combine for lightweight and high rigidity •Newly designed front and rear suspension improve intuitive feel •Marchesini magnesium wheels contribute to light, responsive handling •Cowling designed for optimal wind protection and minimized drag •The position of the water-temperature gauge has been repositioned on the upper portion of the panel to provide the rider with an expanded visual field. Enhancements to front and rear suspension bringfurther improvement in road stability. The use of low-friction materials for sliding parts has improved the action of the front suspension. Also, the damping characteristics of the pressure dampers have been modified to provide linear damping from low speeds. The result is smoother front suspension action during braking and when the throttle is turned on or off. The damping characteristics of the rear suspension have been modified to suit the characteristics of the front suspension. The result is a better feel for the course when entering corners, as well as an enhanced feeling of stability at the bottom of the stroke. The damping power of the steering damper has been modified to provide room for adjustment to suit the riding styles of a wide range of users. This superior road stability helps riders to take the initiative in fierce competition. Completely new meter panels, etc. have been created with a superior finish. In consideration of the visual field and eye movement of the rider, the design of meter panels has been completely changed. The position of the water-temperature gauge has been repositioned on the upper portion of the panel to provide the rider with an expanded visual field. The engine has been improved in its gauge and the precision of the crank case in order to increase overall stability. The cylinder has increased its stability, quality and reliability. The ease of mounting and removal of the front fenders and carburetor boxes has also been improved. In addition, the size of the drive sprocket bolt for fastening has been changed, and the ease for setting and maintenance have also been enhanced. Furthermore, the color of both wheels are now black, as with Works, in order to strengthen the steadfast character. 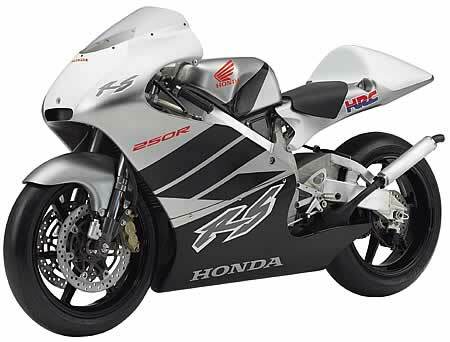 •HRC racing motorcycles are made for competition use ONLY, and are NOT covered by warranty and NOT to be ridden on public roads.•All specifications are subject to change without notice.